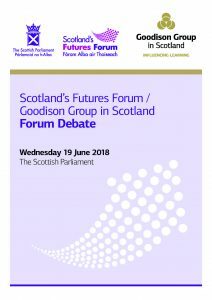 On Tuesday 19 June 2018, the Goodison Group in Scotland and the Futures Forum continued their exploration of schooling and learning in the future, with a focus on primary education in 2030. Dylan and Alexander from the Children’s Parliament outlining the vision of a rights-based primary school, developed with co-director Cathy McCulloch and others within the Children’s Parliament. The event was chaired by Sir Andrew Cubie, Scotland’s Futures Forum director. Dylan and Alexander read stories from a pupil’s perspective in 2003 and 2030, while Cathy read the educator’s story – reflecting from 2030 on how things had improved. Following their presentations, Dylan and Alexander were asked to expand on their vision of the primary school of the future. The discussion covered how teaching would change (“In the future there would be no shouting”), how children with additional needs would be integrated into the school but would have support workers if they were required, and how the Hive – with its network of hubs – could use the existing school buildings but that there would need to be much more space both indoors and outdoors to allow for the range of activities that would be on offer. Following the discussion, participants were asked to reflect on the contributions and to write a ‘postcard from the future’ with their vision of Scotland’s primary schools in 2030. These contributions and postcards inform the scenario for primary education in the future contained in the report.